The first two components of concept set up the core program of philosophical practice: to take a stand on the transcendental problem, by answering the question, "what is the relationship of thinking to world?" The genre of concept construction includes a third feature: a persona that dramatizes in a vital anecdote how the proposed thought mediates the relation of a person to the environment. Instruction: personify the thought proposed by the concept in an appropriate character type or role, enacting the attitude and orientation of the thought. The examples of conceptual personae provided by D&G in several different books, include Socrates, Diogenes, and Empedocles. The anecdote(s) reported in each case allegorize or figuratively enact a mode of reasoning. Socrates: allegory of the cave. The way of the heavens. Conversion = movement through the inference procedures: abduction, deduction, induction. 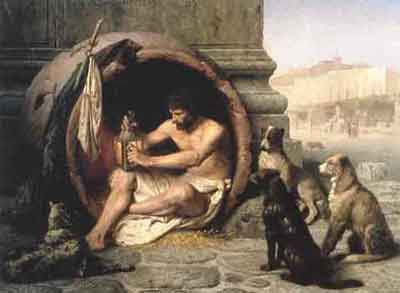 Diogenes: lived in a barrel on the public square, performed all his intimate functions in full view of the citizens. The way of the surface. Perversion = dramatize the metaphor in the idea. Empedocles: threw himself into Mt. Etna, but his (bronze?) sandel floating to the surface betrayed his action. The way of the depths. Subversion = transgression and destruction of forms (madness). The vital anecdote illustrates the particular way the concept is oriented on the plane of immanence, its peculiar movement or path. The etymology of verse or vert + prefix indicates the possibilities, as observed in the descriptors con-version, per-version, sub-version. When you write about “the particular way the concept is oriented on the plane of immanence, its peculiar movement or path,” you invoke the conceptual metaphor of “thinking as moving through space” that Lakoff and Johnson identify in Philosophy in the Flesh. I am interested in the way that you/D&G conceive of the concept (or conceptual persona) as being oriented in a space and moving in a particular way on a certain path. Could we say that it is this movement of the concept that makes it an electrate phenomenon, that enhances the process of thinking “literately”? Now the concept--once a static, ontological equation (“What IS Justice? Justice is…” etc.) --is put into motion: it’s doing something, it’s positioned in a relational, dynamic network of other allegorized concepts, its meaning will be determined by its interactions with these other concepts, the events that emerge from their interactions, the description/mood of that space/place/chora. . . .
Lakoff and Johnson demonstrate in detail the point that concepts, including philosophical operators (the kind of concepts of interest to D&G), are metaphors (language consists of living and dead metaphors, and much of the vitality of language involves spade work: turning the earth). One of Derrida's primary strategies of deconstruction is to return to the metaphorical root and take a different branch of the vocabulary. "Method" (for example), is Meta Hodos, moving along a path. In literacy the metaphor is forgotten or non-essential to the working word. Part of our project is to reconfigure "concept" for digital imaging environments, in which the sensory dimension of the construct is supported and becomes dominant. It is not just the movement (although that is important) but any sensory element of the assemblage that is foregrounded. Concepts must be camera-ready.